Public safety is moving from outdated communication systems to 4G LTE to meet the need for data in daily operations and emergency situations. However, public safety cannot move to public safety LTE with current commercial LTE architectures because commercial LTE has coverage gaps in areas that may not be commercially viable. Parallel Wireless Public Safety LTE communication solution provides a unified resilient LTE network for police, fire, ambulance, and armed forces in tactical operations, emergencies, and day-to-day communication – all at much lower cost. It can even be deployed instantly in ad hoc scenarios as a deployable/man portable solution! 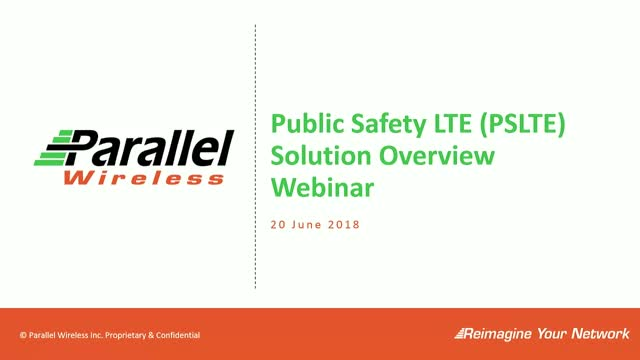 Please join us on June 20 at 9:00am EDT for a not-to-be-missed webinar where we will discuss our public safety LTE solution which has been installed in 25+ global military, police, and fire deployments and has been selected by a public safety LTE network in Europe. ﻿In this webinar, you will learn how Parallel Wireless innovative Public Safety LTE architecture addresses the needs of network control, coverage everywhere, and resilience while allowing graceful and cost-effective migration to LTE. 5G demos, use cases, etc. 5G: Small cells or Macrocells? At TIP summit, Vodafone and Telefonica expressed the importance of disaggregating hardware and software to make RAN open, easy and cost effective to deploy and maintain. Both operators also highlighted the necessity of software-based network solutions being able to support ALL Gs. Join our webinar to learn how Parallel Wireless all G telecom software reimagines All G (2G/3G/4G/5G) networks by abstracting and consolidating RAN and core network functions and by fully orchestrating and optimizing the whole network. As a result, global MNOs will benefit from ALL G networks becoming unified, programmable, automated, agile and future proof to deliver an optimal network performance for all use cases: low density/high density, IBS or public safety 4G/LTE. Secure your webinar spot today! At AfricaCom 2018, the Parallel Wireless team will demonstrate how their 2G/3G/4G solution enables mobile operators to cost-effectively deploy or expand their networks to enable a clear, cost-effective migration plan to 5G! This solution enables service providers in Africa to instantly provide voice and data services to their end-users, even when network infrastructure is limited. Tune into this not-to-be-missed webinar to hear from the team and learn more about this solution as well as the demonstrations that took place at AfricaCom and the announcements made by Parallel Wireless and their customers! Attend our webinar to learn all about our Open vRAN solutions and demonstrations from the event! Parallel Wireless is on a mission to connect the 4 billion unconnected people by reimagining the networks. The reimagined 2G/3G/4G cellular architecture enables operators to connect things and people at home, work, play and in emergencies by deploying any G cellular networks as easily and as cost-effectively as enterprise Wi-Fi whether for rural, enterprise, public safety, M2M, Smart Cities, or dense urban. The company is in production on six continents and engaged with many leading operators worldwide. Parallel Wireless’ innovation and excellence in multi-technology open virtualized solutions has been recognized with 40 industry awards.